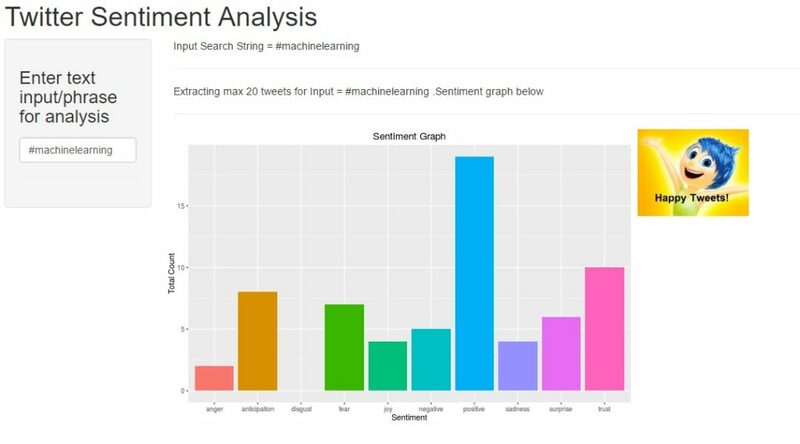 Today’s post is a 2-part tutorial series on how to create an interactive ShinyR application that displays sentiment analysis for various phrases and search terms. The application accepts user a search term as input and graphically displays sentiment analysis. As always, the entire source code is also available for download on the Projects Page or can be forked from my Github account here. authorize twitter api to mine data, using setup_twitter_oauth() function and your Twitter developer keys. # look for all tweets containing this search term. The bargraph is created by assigning numeric values for each of the positive and negative emotions using the tweet text. Emotions used – anger, anticipation, disgust, joy, sadness, surprise, trust, overall positive and negative sentiment. 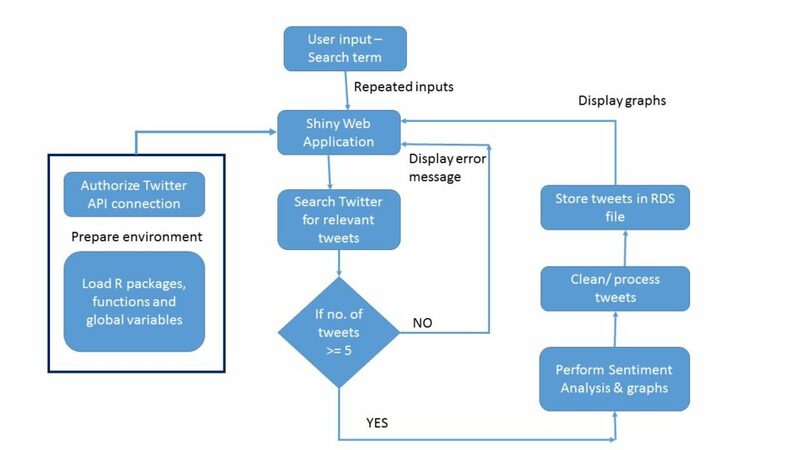 The actual Shiny application design and twitter connectivity are explained in the next post. Olympics season is in full swing. 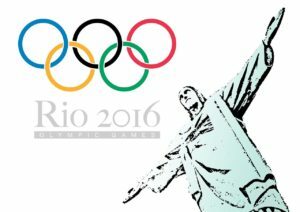 In keeping up with the spirit of this pinnacle of sports, we will use the Twitter API to extract tweets related to Rio2016 and analyze them to extract insights. perform a sentiment analysis indicating overall emotions associated with such tweets. *IMPORTANT* learn how some of these steps can be used to monitor your brand and extract customer sentiment. 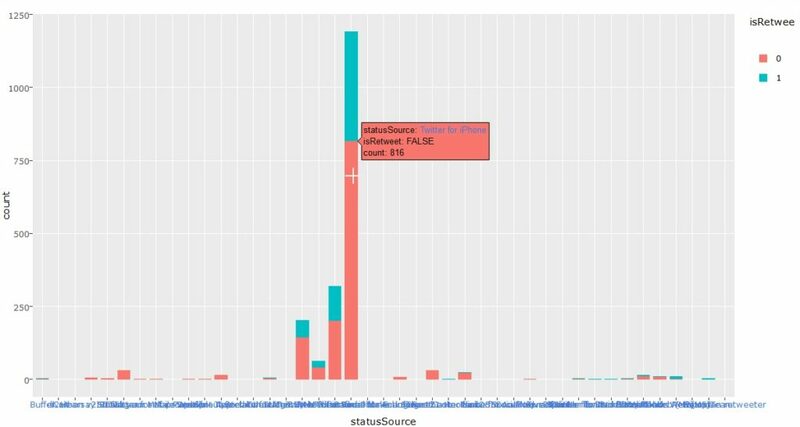 We will use R programming to perform the analysis using Twitter API keys (learn more about how to request these keys here) and the amazing “TwitterR” package to gain clearance permission for data extraction from the Twitter website. We will search Twitter for all tweets with the tag “#TeamUSA”. Note, the “geocode” option is optional in above command, but I added it to consider tweets from users whose profile location is Philadelphia, ensuring coverage by NBC/Fox are definitely picked up! We save the tweets in a RDS file for easy access. First, we remove all special characters and emojis from tweets using the sapply() and iconv() function. We convert the created time to Brazil time. Note, Rio de Janeiro follows Chicago timezone, i.e 1 hour behind Philadelphia/NYC. We add a new variable to determine digital device type used for these Tweets, using the device url Twitter provides under column “StatusSource”. The graph clearly shows iphones dominating the user base. We use the “text” column from tweet_doc object to create a word dictionary of the tweets after removing punctuation and unwanted characters. The size of the words increases with their frequency of appearance in the tweets. 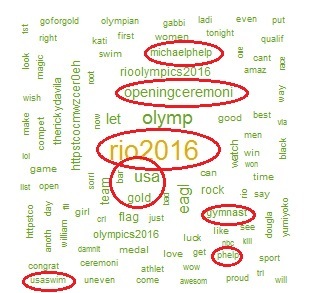 The image alongside shows such a wordcloud with highlighted words indicating high-frequency phrases. 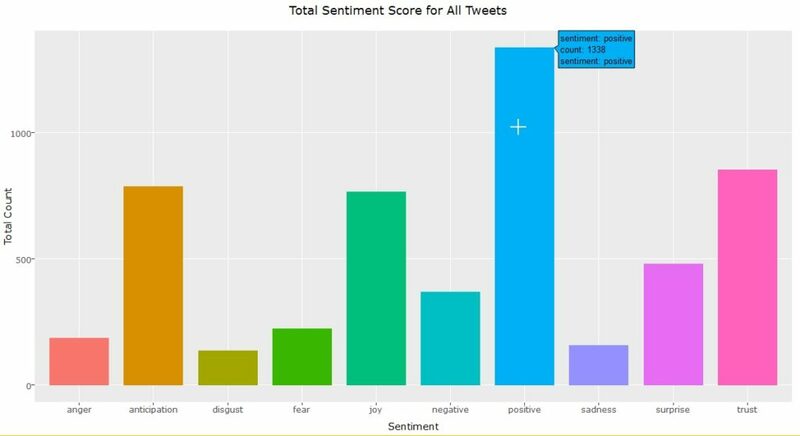 We use the “syuzhet” library to assigns emotional value to each of the 2000 tweets we extracted using the get_nrc_sentiment() function. 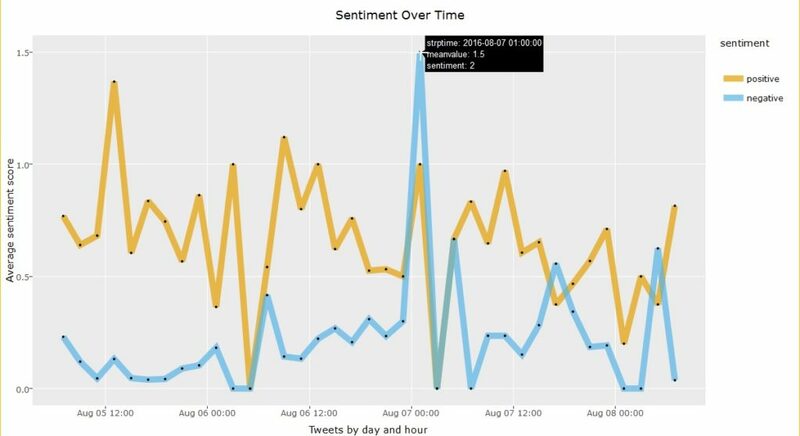 Positive tweets peak at noon on Opening Ceremony day (aug 5) and negative sentiments peaked on Aug 7 morning. Step 5 – Usage for Brand monitoring. Instead of “#TeamUSA” we can use any other tag or company/blog name or product or any other relevant tags to mine Twitter for tweets. Periodically monitor the tweets about your product or brand to ensure that your “sentiment graph” always tends to positive emotions. If not, ensure your staff is working diligently to counter any negative tweets/ concerns among your users. 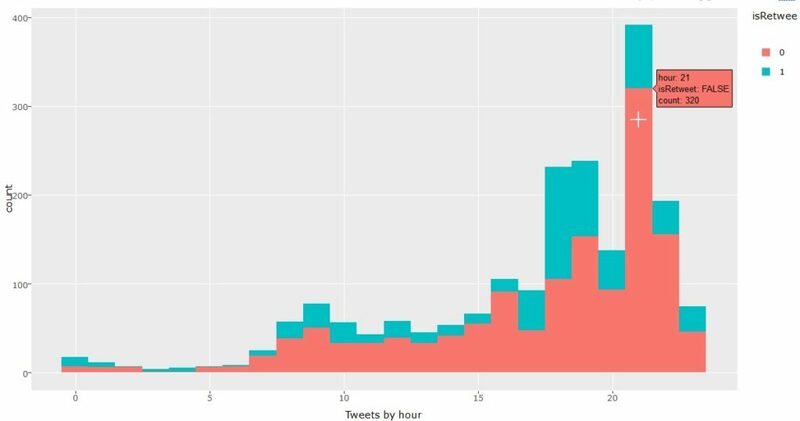 The graphical analysis for “Tweets by hour of day ” could be used to monitor what time your users/ audience is most active. You could use this insight to publish more content during this time and to ensure your customer support is always available during this period to effectively engage your audience. If your “device type” graph indicates any specific device (e.g: specific Android phone brands) make sure your content caters correctly for mobile users. The theme for August is API programming for social media platforms. For the August project, I’ve concentrated on working with Twitter API, using both Python and R programming. The code can be downloaded from the Projects Page or forked from my Github account. Before we learn what the code does, please note that you will first need to request Twitter developer tokens (values for consumer_key, consumer_secret, access_key and access_secret) to authorize your account from extracting data from the Twitter platform. If you do not have these tokens yet, you can easily learn how to request tokens using the excellent documentation on the Twitter Developer website . Once you have the tokens please modify these variables at the beginning of the program with your own access. Second, you will need to install the appropriate twitter packages for running programs in Python and R. This makes it easy to extract data from Twitter since these packages have pre-written functions for various tasks like Twitter authorization, looking up usernames, posting to Twitter, investigating follower counts, extracting profile data in json format, and much more. “Tweepy” is the package for Python and “twitteR” for R programs, so please install them locally. Although Twitter provides a great way to view your own twitter follower growth, there is no way to download or track this data locally. The Python program ( twitter_follower_ct_ver4.py) added in this month’s code does just that – extracts follower count and store it to csv Excel file. This makes it possible to track (historical) growth or decline of Twitter follower count over a period of time, starting from today. With this program that you can monitor your own account and other twitter handles as well! Of course, you can’t go back in time to view older counts, but hey, at least you have started. Plus, you can manually add values for your own accounts. Follower count is great, but you also want to know the detailed profile of your followers and other interesting twitter accounts. Who are these followers? Where are they located? There are 2 R programs in the August Project which help you gather this information. The first (followers_v2.R) extracts a list of all follower ids for a specific twitter account and stores it to a file. Twitter API has a rate limit of 5000 usernames for such queries, so this program uses cursor pagination to pull out information in chunks of 5000 in each iteration. Think of the list of follower ids like the content on a book – some books are thicker, so you have turn more pages! Similarly, if a twitter account has very few followers, the program completes in 1-2 iterations! The program example works on the twitter account “@phillydotcom” which has >180k followers. The cursor iteration process itself is implemented using a simple “while” loop. The second R program ( dets_followers_v2.R ) uses the list of follower_ids to pull in detailed information about followers. For the scope of this project I am only deriving screen name, username, location and follower count for all of my Followers. Details are stored in a tabular format as shown in image alongside. You can avail this data to geographically segment your Twitter followers, analyze “influencer” followers (users with 25000 or more followers) and lots more. Please take a look at the code and provide your valuable feedback and comments in the comments section. / JOURNEYOFANALYTICS / Comments Off on Happy House-Warming! Welcome to the new Blog homepage for Journey of Analytics. The old blog is still live and all old content will still be available on the previous site. So if you have bookmarked any links or pages, they will still work. However, new posts will no longer appear on the old site, so please bookmark this page as well. Thank you being a loyal reader with Journey of Analytics.